A regular breeding resident and migrant; the Black Tern was an uncommon species during the Minnesota Breeding Bird Atlas (MNBBA). Global in distribution, in North America the Black Tern is broadly distributed across the northern United States and central Canada, ranging from British Columbia and eastern Oregon and Washington, east through the Great Lakes, southern Ontario, and southwestern Quebec. Scattered populations occur just to the south and east of this range. The core of the Black Tern’s breeding range occurs in the prairie potholes of the Dakotas and the Canadian Prairie Provinces (Figure 1). Assigned a Continental Concern Score of 12/20 by Partners in Flight, and designated a species of Moderate Concern by the North American Waterbird Conservation Plan and a Common Bird in Steep Decline by the North American Bird Conservation Initiative. Designated a Species in Greatest Conservation Need by the Minnesota Department of Natural Resources, and a Target Conservation Species by Audubon Minnesota. A medium- to long-distance migrant that spends winters along the coasts of Central America and northern South America. Feeds primarily on aquatic insects secured by dipping its bill to the water’s surface while in flight. A shallow platform of aquatic vegetation built on a mat of floating vegetation or atop muskrat houses; occasionally found on floating debris, boards, mud patches, artificial nesting platforms, or nests abandoned by other marsh-nesting birds. Breeding distribution and relative abundance of the Black Tern in North America based on the federal Breeding Bird Survey, 2011–2015 (Sauer et al. 2017). In the early 1900s, Roberts (1932) not only described the Black Tern as “an abundant summer resident, breeding throughout the state” but also wrote that “no other water-bird is more generally and abundantly distributed in Minnesota.” It could be found, he wrote, in suitable wetlands “in all parts of the state.” Knowing the rarity of the species’ marshy habitat in the far northeastern and north-central corners of Minnesota, one has to question Roberts’s broad assertion of its statewide abundance. Confirmed nesting records (nests with eggs) were available from only a handful of central and western counties and locations that Roberts and his colleagues visited most frequently: Hennepin (Minneapolis), Kittson, Morrison, and Sherburne Counties and Leech Lake. Birds constructing nests were observed in Marshall County. Forty years later, Green and Janssen (1975) described the tern’s statewide distribution as including all but the extreme northeastern region of the state, with no confirmed nesting reports from Lake or Cook Counties. Janssen (1987) later noted the tern’s absence not only from Lake and Cook Counties but also from large portions of St. Louis and Koochiching Counties. He wrote that it was rare in southeastern Minnesota, in counties just west of the Mississippi River floodplain, and had declined in abundance throughout the river valley. Elsewhere in the state he delineated 30 counties where nesting had been confirmed since 1970. Hertzel and Janssen (1998) later added an additional 9 counties to the list. Concern regarding the species’ status prompted the Minnesota Department of Natural Resources to conduct a statewide survey from 1990 through 1995. Observations were solicited in response to a “Black Tern Wanted” poster, which was widely distributed throughout the state. Observations were reported from 71 counties, and breeding was confirmed in 35 counties. Although there were reports from all but 1 northeastern county (Cook), nesting was confirmed only as far east as Itasca and Aitkin Counties (Baker and Hines 1996). Similar results have been documented by field staff with the Minnesota Biological Survey. Since the late 1980s, they have identified 475 breeding season locations widely distributed across the state. Overall, the species was least abundant in southeastern Minnesota and was absent from the Arrowhead region, including Carlton and Pine Counties to the south (Minnesota Department of Natural Resources 2016). During the MNBBA, participants reported 754 Black Tern records in 10.6% (503/4,751) of the surveyed atlas blocks and in 10.5% (245/2,337) of the priority blocks. Breeding evidence was confirmed in 88 (1.9%) of the surveyed blocks (Figures 2 and 3; Table 1). The species was observed in 72 of Minnesota’s 87 counties; breeding was confirmed in 38 counties. The latter included 15 counties not depicted in the county distribution map published by Hertzel and Janssen (1998): Carver, Clay, Cottonwood, Freeborn, Hubbard, Isanti, Kittson, McLeod, Meeker, Mille Lacs, Red Lake, Rice, Sibley, Stevens, and Wadena. The landcover suitability model generated for the Black Tern using MNBBA data predicts that habitat is most suitable in the central regions of the state, from eastern Anoka County west to Big Stone County, and north to southern Beltrami and western Itasca County (Figure 4). Scattered pockets outside of this area are distributed throughout the state and include the extensive wetlands in eastern Marshall County and the Swan Lake wetland complex in Nicollet County. Notwithstanding Roberts’s original assertion regarding the species’ statewide distribution, it appears that the overall distribution of the Black Tern has remained relatively unchanged over the past 100 years. The species is widely distributed across the state except in northeastern, north-central, and portions of southeastern Minnesota and the most intensively cultivated regions of the Red River valley. The same is true elsewhere in the tern’s breeding range. Although the southern edge of its distribution in North America has receded, the overall extent of the species’ distribution has changed very little since the late 1800s and early 1900s (Heath et al. 2009). Despite retaining the same overall distribution, other states and provinces in the region, including Michigan, Ontario, South Dakota, and Wisconsin, have documented significant population declines. In Michigan, 89 colony sites that were identified during the state’s first atlas (1983–1988) had been abandoned by the second atlas (2002–2008), and only 50 new colonies had been established, resulting in a net loss of 39 colonies (Chartier et al. 2013). Breeding distribution of the Black Tern in Minnesota based on the Breeding Bird Atlas (2009 – 2013). Summary statistics of observations by breeding status category for the Black Tern in Minnesota based on all blocks (each 5 km x 5 km) surveyed during the Breeding Bird Atlas (2009-2013). Summary statistics for the Black Tern observations by breeding status category for all blocks and priority blocks (each 5 km x 5 km) surveyed during the Minnesota Breeding Bird Atlas (2009-2013). Landcover suitability of the Black Tern in Minnesota based on habitat, landscape context, and climate data gathered during the Minnesota Breeding Bird Atlas (2009-2013) using the MaxEnt modeling approach. The Black Tern is largely an inhabitant of shallow, productive wetlands with emergent vegetation covering 25% to 75% of the wetland (Figure 5). Such sites may be found in small isolated wetlands (generally >8 hectares), in large wetland complexes, in the backwater marshes of large river floodplains, and in shallow, protected bays of lakes (Zimmerman et al. 2002; Wires et al. 2010). Within these sites, nests are placed either within stands of emergent vegetation or out in the open water on floating vegetation or debris. Smaller marshes (10 ha) are used when they are in proximity (1–4 km) to larger wetlands (Soulliere et al. 2007). Generally, terns select wetlands that are embedded in landscapes with a high density of wetlands. They also prefer landscapes where the upland habitat is grassland and avoid those with agricultural or forested landscapes (Naugle et al. 2000; Naugle et al. 1999). Studies conducted in Minnesota provide additional details regarding preferred wetlands and nest sites. For example, in Kittson and Roseau Counties, Brewer (1992) found dense cattail stands were usually avoided as nest sites. Instead, the birds preferred sites with lower stem densities and higher species diversity. Bulrushes and horsetails were frequent components of the emergent community selected for nesting. Selected stands of emergent vegetation were intermixed with open water, resembling hemi-marshes, where there is an equal mix of open water and emergents. An intensive study conducted on the Agassiz National Wildlife Refuge in Marshall County from 1992 to 1994 found that Black Terns used sites that had an average of 72% emergent cover; no nests were found in sites with less than 40% cover. The authors speculated that higher cover density reduces the negative impacts of wind and wave action on nests and helps conceal the eggs and young chicks from predators (Maxson et al. 2007). As Brewer (1992) found, bulrushes and sedges were preferred nesting sites, although cattails were used when they were the dominant vegetation. Mean water depth at nest sites on the refuge ranged from 18 to 114 cm; nests were never more than 7 m from open water. Farther south, in the Minnesota River valley, Dulin (1990) found that nesting was more likely when the water levels were low enough to expose the root masses of bulrushes right at the water surface or a couple of centimeters above the surface. Typical breeding habitat of the Black Tern in Minnesota (© Lee A. Pfannmuller). As for most marsh birds, population estimates are generated by expert opinion regarding the relative abundance of the species. The North American Waterbird Conservation Plan estimated the North American population at 100,000 to 500,000 individuals (Kushlan et al. 2002). Biologists with Wetlands International (2015) place the estimate at 300,000 to 750,000 birds. Others have estimated that the U.S. population alone numbers in the “low hundreds of thousands” (Shuford 1999). Recently Partners in Flight (2017) estimated the global population to number 850,000 individuals. No statewide estimate for Minnesota is available. The Black Tern is distributed widely enough that the federal Breeding Bird Survey (BBS) is an effective population monitoring tool, both nationwide and in Minnesota, despite its limitations in monitoring wetland species. Since the survey began in 1966, BBS data across the survey region have demonstrated a nonsignificant population decline, averaging 1.37% per year. From 2005 to 2015, the trend has reversed, increasing an average of 3.93% per year (Sauer et al. 2017). In Minnesota, however, the species has shown a far more dramatic, statistically significant decline of 6.29% per year since 1967, slowing only slightly to a loss of 5.61% per year from 2005 to 2015. The cumulative loss has been nearly 96% (Figure 6). Only three other Minnesota breeding birds that are well monitored by the BBS have experienced larger annual declines over the same time period: Grasshopper Sparrow, Purple Martin, and Western Meadowlark. Habitat loss and degradation are considered by many to be the primary factors responsible for the species’ decline. The loss of nearly 54% of the wetlands in the United States since European settlement has impacted all wetland-dependent species. Wetlands that remain, even those that are well protected, are often subject to major water-level fluctuations during drought conditions and heavy rains, which directly affect nesting success. Overgrowth of emergent cattails in wetlands also poses a challenge, as the terns rarely nest in sites with greater than 75% cover (Heath et al. 2009). 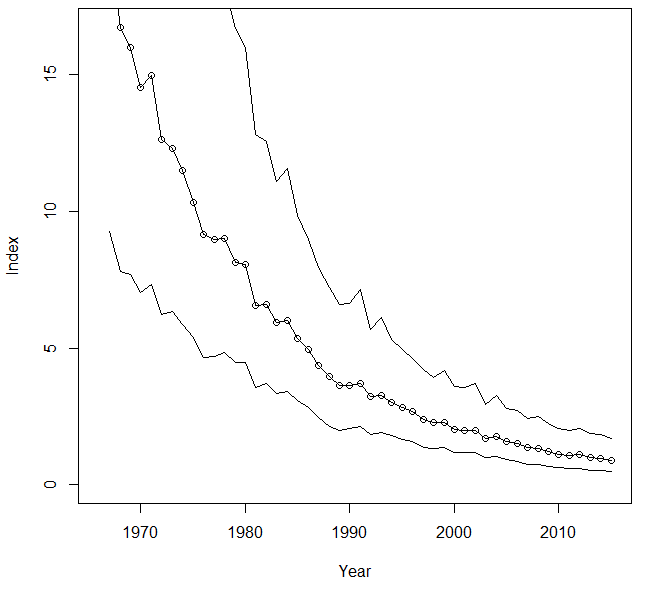 Breeding population trend for the Black Tern in Minnesota for 1967–2015 based on the federal Breeding Bird Survey (Sauer et al. 2017). The Black Tern’s steep population decline has been recognized by numerous conservation organizations and resource agencies. At the federal level, the U.S. Fish and Wildlife Service has prepared a status assessment and conservation plan for the species (Shuford 1999) and listed it as a focal species for conservation action beginning in 2012 (U.S. Fish and Wildlife Service 2011). With a Continental Concern Score of 12/20 (Partners in Flight 2017), the tern was also recently identified as a Common Bird in Steep Decline by the North American Bird Conservation Initiative (2014). Regionally, it is a focus of attention by a variety of conservation efforts, including the Upper Mississippi River and Great Lakes Region Joint Venture (Soulliere et al. 2007). The North American Waterbird Management Plan designated it a species of Moderate Concern (Kushlan et al. 2002). At the state level, the Black Tern is officially listed by many of the Great Lakes states, including Wisconsin (endangered), New York (endangered), and Ohio (endangered). The species is not listed in Minnesota but has been designated a Species in Greatest Conservation Need (Minnesota Department of Natural Resources 2015). Audubon Minnesota has designated it a Target Conservation Species and has prepared a statewide conservation plan (Pfannmuller 2014). The latter adopts the Partners in Flight national population objective to double the current population over the next 30 years. Specific actions to achieve this goal are delineated, including the need to protect and/or restore nearly 200,000 acres of wetland habitat in Minnesota. In addition to protecting and restoring large wetland complexes, specific management recommendations have been recommended by several conservation plans and tern biologists (e.g., Wires et al. 2010; Shuford 1999; Soulliere et al. 2007; Zimmerman et al. 2002; Faber 1992). Chief among the recommendations is the importance of managing water levels to promote emergent vegetative growth and to insure stable water levels during the nesting season. When emergents become too dense, precluding use by Black Terns, a variety of practices can be employed to reduce the amount of cover, including disking, prescribed burning, and the use of herbicides. Providing for healthy muskrat populations can also keep cattails at bay. Artificial nesting platforms have been used with some success, as documented in a study by Faber (1992) in southeastern Minnesota in the Mississippi River floodplain. Unfortunately, like many species dependent on the prairie wetlands of the northern Great Plains states and Canadian Prairie Provinces, the Black Tern may be significantly threatened by warming temperatures in the coming years as drought conditions and extreme storms become more common. A recent modeling analysis by the National Audubon Society predicted that the species could lose nearly 21% of its current summer breeding range by the year 2080 and classified the species as “climate threatened” (Langham et al. 2015; National Audubon Society 2017). Although the loss is considerably less than that predicted for many species dependent on the prairie potholes, the species’ dramatic population decline could reduce its ability to readily adapt to changing conditions. Clearly, the Black Tern is a species that warrants close attention in the years ahead. Maxson, Stephen J., John R. Fieberg, and Michael R. Riggs. 2007. “Black Tern Nest Habitat Selection and Factors Affecting Nest Success in Northwestern Minnesota.” Waterbirds 30: 1–9. Naugle, David E., Kenneth F. Higgins, and Sarah M. Nusser. 1999. “Effects of Woody Vegetation on Prairie Wetland Birds.” Canadian Field-Naturalist 113: 487–492. Naugle, David E., Kenneth F. Higgins, Michael E. Estey, Rex R. Johnson, and Sarah M. Nusser. 2000. “Local and Landscape-level Factors Influencing Black Tern Habitat Suitability.” Journal of Wildlife Management 64: 253–260.